And it will cause the Banks to Tighten the Noose. A terrible bit of news went unnoticed in the commotion amid the rebound in oil prices over the past two weeks. While every news outlet shouted about Iran and OPEC, a U.S. energy icon quietly announced news that could potentially shatter the industry. As I’ve explained recently, many oil companies are teetering on the brink of bankruptcy. But news out of Alaska could lead to disaster. 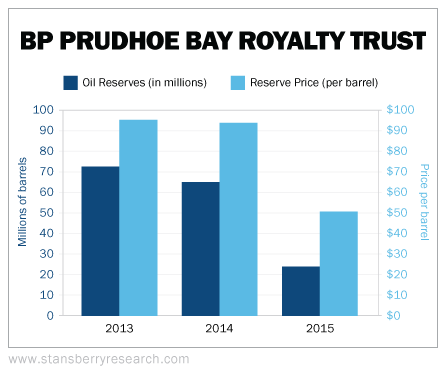 BP Prudhoe Bay Royalty Trust (BPT) – operated by the Alaskan division of oil giant British Petroleum (BP) – sells oil from the Prudhoe Bay oilfield. It just announced a 65% drop in its economic oil reserves. We’ll explain exactly what that means in a moment, but you can expect the numbers that the other area shale explorers release in the coming weeks will be even worse. From 1968 to 2015, Prudhoe Bay was the most prolific oilfield in the country, according to the U.S. Energy Information Administration (EIA). Today, Prudhoe Bay ranks third in the U.S. behind Texas’ Eagle Ford and Spraberry Shales. Prudhoe was so large, three major oil companies – BP, Arco, and Humble Oil – spent $8 billion in 1977 constructing the Trans-Alaska Pipeline System (TAPS) to bring its oil to market. That’s more than $31 billion in today’s dollars. Even though an oilfield can hold a tremendous amount of oil, only some of that oil is profitable at certain prices. Those barrels are called economic reserves. And that’s where the problem lies. As you can see, from 2014 to 2015, the average price per barrel fell 47%… but the reserves fell 65%. That’s a huge change from 2013 to 2014, when reserves fell just 10%. Prudhoe Bay is a giant legacy field, with a vast network of pipes and wells already in place. So production costs are lower there than in most shale fields. So if Prudhoe Bay’s economic reserves fall 65%, the rest of the industry is in big trouble. Reserve calculations will be a big problem for most U.S. oil companies as they report over the next few weeks. Using the new $50.28-per-barrel price is going to result in a massive reduction in U.S. oil reserves. In some cases, certain companies could have zero economic reserves left. Notice that some high-profile shales aren’t on the list. For example, companies drilling in the Bakken’s Elm Coulee region need oil prices to stay above $72 per barrel to be economic. Companies drilling the Permian Basin’s Cline Shale need $64-per-barrel oil to make money. That oil won’t be considered reserves this year. Don’t be surprised to see some of these shale explorers take major reserve decreases. When that happens, the banks will have no choice but to tighten up the amount of money they can lend. Less collateral means smaller loans. It isn’t just the economic reserves that is the problem, but reserves in general. It is very close to the point that reduced north slope output has declined to the point that it is impossible to transport the oil by pipeline due to volume declines and cooling. The decline is such the oil does not stay warm enough to flow properly through the pipe, itself. When that happens, first the window of pumping reduces to warm weather months, and then it will cease entirely as you simply can’t stop and start production. How long before this happens? Maybe a few more years. I wouldn’t buy any assets based on Alaska production other than equipment offered through bankruptcy auctions. Ritchie Brothers has been doing very well for a long time. I suspect it will be doing even better. Paulo you are correct. The heavy equipment auction scene is on fire. Some absolutely, wonderfully cheap deals to be had. Case in point; At an auction in Australia recently, a piece of earth moving equipment (CAT) which originally new for $2.2 million US, sold for $26,000 ! This situation mirrors what has happened to Caterpillar (CAT) and their dismal global retail sales record over the past +1 year being constantly negative. Their longest stretch of no growth/negative sales in the companies history. I imagine the same holds true for their Asian counterparts such as Komatsu, Hitachi, Daiwoo, etc. Komatsu has been doing quite well, Hitachi a bit less, albeit the Construction Equipment division is still profitable. Since 2008 Caterpillar has fallen prey to the M&A mania, and that may explain part of their problems. They’ve bought a lot, especially in the rail road sector and a significant part of that expansion in rolling stock and related technologies/services came in (drumroll) Brazil. Just not to miss the train (pun intended) they also expanded their mining equipment manufacturing capacity in the South American country. It’s telling in 2008 Cat bought Lovat, a Canadian tunnel boring machine manufacturer, amid great fanfare. In 2014 it was closed down due to the inability to keep up with competitors such as Herrenknecht. Cat has been losing ground everywhere, and not just due to the commodity crash (soon to be reverted, and soon to get far worse): Cat for example is losing the profitable feller-buncher market to Komatsu, Doosan and even newcomer (in the sector) John Deere. Why? Because their products are extremely expensive but that superior price does not translate into technical superiority. Pricing seems to be Cat’s major problem: everything about them, from spare parts to industrial diesel engines, carries a hefty premium for no tangible advantage. The Cat board seems fairly convinced we are still living in the 60’s and that people will willing pay a premium for the Caterpillar brand. They seem not to notice many manufacturers offer products at their same level but at a lower price (Doosan, Kubota etc) or at about the same prices but superior under the technical point of view (Komatsu, MAN Diesel etc). John Deere has been in the feller-buncher business for many years. Komatsu, although a good product, has poor dealer support. And if you ever have to leave something for your widow, better buy Cat. You don’t buy an investment in long-term capital equipment on up front price. Unless, of course, you are a fool. Kam, I am replying here because of software limitations. That may be true for the US market, but the US market is only a part of worldwide markets. I can assure you here Cat has become a pariah. The reason everybody gives me are the same: too expensive. The Japanese and the Koreans have been very aggressive here since 2010 or so: they have built up nice dealership networks and are pricing their products just right. Doosan in particular is on a roll. Regarding feller-bunchers: Deere only started selling them here in 2014 and Doosan the year before. Before it was more or less a Komatsu monopoly. Until 2009 most Komatsu’s were assembled from knockdown kits in Finland and branded as Valmet but after that date we started getting Komatsu’s branded as such. Strong dollar killing CAT. Oberhelman also killing them. Just a terrible CEO. Bought at the top and forced to write-off huge investments. What a waste!!! TOKYO — Komatsu looks to cut 50 billion yen ($442 million) in costs by the end of fiscal 2017 through monitoring inefficiencies on the ground and maximizing productivity amid a cloudy outlook for the construction machinery market. The production of construction machinery requires lots of power, steel and components, plus a variety of machines on the line. The Japanese company has installed a device on each of over 100 metal-processing machines to track their use, with plans to boost that number to minimize the time the machines stand idle. The measure could cut production time by roughly 30% per unit, saving the company about 10 billion yen. Komatsu also adopted a central tracking system for global demand in replacement parts at its key facility in Tochigi Prefecture. The company hopes to manage its inventory more efficiently by predicting trends better, which could reduce the cost of sending rush orders by air. The company expects to save billions of yen. Komatsu is expected to log a 5% slide in group sales to 1.88 trillion yen and a 9% drop in operating profit to 221 billion yen for the fiscal year ending March 31. The market projects a further decline in profit for fiscal 2016. I could be wrong about this, but I thought SEC reserves were based on the NYMEX going forward, not on historicals. Also, this is really not news. Banks have been tightening up credit to producers for more than a year. This “new” reserve write down isn’t going to have any new effect. 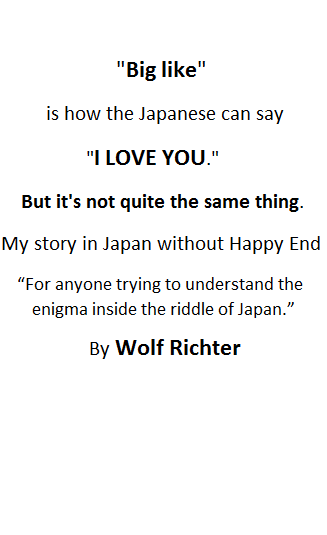 There’s no disclosure but hopefully the author has skin in the game. Who would most likely be elected US president assuming the economy were to crater? Oh, and I’m sad to hear Alaska has run out of oil, will I be able still to fill the gas tank in my car or should I go do that tonight?